The following is a guest post for MediaShift, and doesn’t necessarily represent the views of the publication. Read more here about guest posts. Native advertising, which Forbes defines as “ads…designed to fit so closely with a publication’s content that they appear to be part of a publication,” is often described as a tool news organizations need to maintain a steady revenue stream. While the practice is lucrative, it also jeopardizes the editorial independence of newsrooms as journalists become aware of what advertisers want them to discuss. Today, brands are able to work with journalists in unprecedented ways that are difficult to regulate, because very few people know how such partnerships between advertiser and publisher are negotiated. 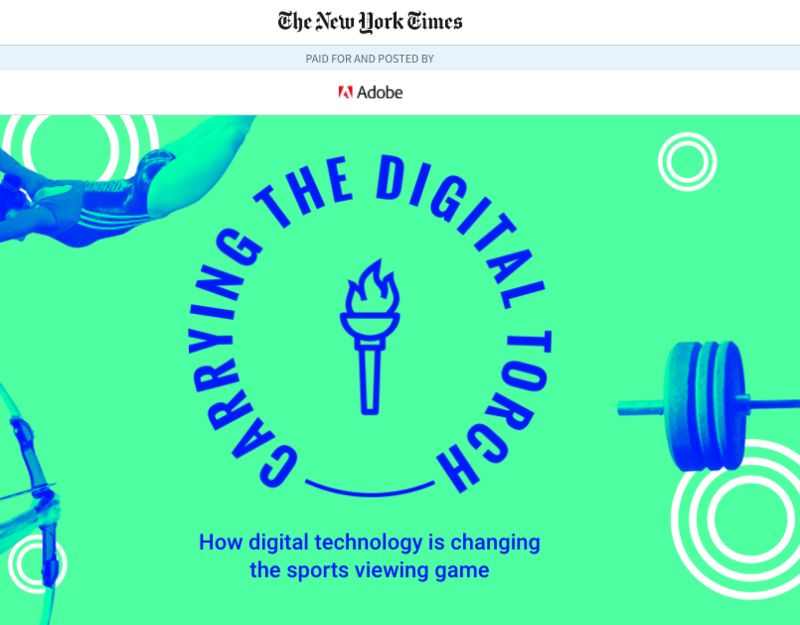 Today publishers are increasingly finding ways to partner with advertisers on custom content without being transparent to readers about these deals. I worked at the New York Times’ branded content studio, T Brand Studio, for two years. During this time, I found that native ads felt hackneyed to the people creating them. When the practice first started, its focus was on crafting branded articles that gave readers a compelling narrative behind a company’s new product or service. Today publishers are increasingly finding ways to partner with advertisers on custom content without being transparent to readers about these deals. As media critics, academics, and news consumers debate the ethics of native advertising, I fear they’re missing the larger story of how publishers are evolving their business model to secure revenue. Advertisers are asking the New York Times and other news publishers for more. They want to work with the newsroom in deeper and more complex ways. To combat this breakdown of the editorial and advertising wall, media watchdogs need to fight for regulation that demands news publishers disclose which brands they are working with and what they have been asked to produce. As a Creative Strategist in T Brand Studio, I was tasked with crafting proposals that showed marketers how the Times could create bespoke advertising opportunities that would capture an engaged audience. In practice, this means working closely with the sales staff across specific categories such as finance, live entertainment, and luxury, and to respond to RFPs (requests for proposal). A common theme in these RFPs was a request for something that “has never been done before.” This wasn’t a surprise, because it is not always enough to offer a brand digital ad space: rather, content studios need to deliver creative ideas to clients. When I worked in the finance category, this often meant communicating how a bank could provide readers with helpful information while also highlighting the benefits of their services. This involved sharing a headline for a branded article, or paid post, as well as a high-level outline of what the article would discuss. It quickly became obvious that pitching branded articles was not nearly enough: After a financial client runs one native ad outlining how they enable people to invest in the things they care about, the revenue stream is dead. This means that the advertising department needs to create additional opportunities for clients. You don’t have to look further than LinkedIn or NYT’s public job portal to see that the paper is actively developing new ad formats that further blur the line between news and advertising. For example, Michael Villasenor is currently the creative director of Ad Marketing and Innovation. His responsibilities, as he describes them, are to “work alongside the publisher and newsroom team to ensure that we properly support all of their marketing needs. This also includes developing original digital and print ad materials in order to secure never-been-done-before treatments within the marketplace.” Today, publishers must create advertising opportunities that enable brands to champion content series editors may want to work on. This development actually outstrips concerns over the labeling of native ads. When the newsroom wants to work on special series of stories, they may reach out to T Brand to see if it will be easy to underwrite the editorial initiative with advertising dollars. When T Brand gives editors feedback on what clients want (articles on 401k, retirement, etc. ), the editors may decide to pay more attention to such topics than they would have initially. Now, this isn’t something that will ever be explicitly stated. Rather, it will be baked into the larger partnership between advertiser and publisher. The demands advertisers have placed on publishers have evolved quite ominously from T Brand’s inception in 2014. Debate over the clear labeling of branded articles seems like child’s play today. Now many regulators — and even people in the industry — have a hard time defining what should be labeled as native content. It is no longer as easy as spotting a branded article and asking a publisher to put a disclaimer on it. NYT’s partnership with Samsung is a prime example of this. The Times was a perfect partner to deliver 360-degree content for the promotion of Samsung’s technology, because the paper had established a strong reputation in the VR space. Last year, staff at T Brand Studio and my co-workers on the Creative Strategy team were asked to create a custom advertising opportunity for Samsung that involved the newsroom. This campaign was called The Daily 360. Money changed hands and yet the PR and headlines around the campaign never called it a native ad or sponsorship. Instead the Times press release included a small footnote reading: “Times journalists have been provided with Samsung Gear 360 cameras and equipment to use while reporting out in the field.” Neiman Lab’s report mentioned the deal as a “partnership” with Samsung, with an exchange of technology, and noted that Samsung could publish the videos on their own platforms. This example is not meant to highlight only the blurred lines between advertising and editorial. There are enough articles across the internet on how journalism is doomed, but offer neither solutions nor sympathy for the plight of newsrooms across the nation. The New York Times is still committed to protecting the unadulterated vision and agenda of its newsroom: this has not changed. What has changed is the level of transparency, across publishing, that is provided to readers and media watchdogs. Rather, the Samsung example shows the pace at which publishers are forced to generate novel advertising opportunities in an effort to secure much needed revenue. While my first-hand experience has been with the Times, the RFPs and negotiations between publisher and advertiser to blur the line is an industry-wide trend. It is nearly impossible for people to know what to regulate if they can’t even spot the advertising execution after it has gone live. Currently, no rule or policy exists that require news outlets to disclose that they have received x dollars from y client to produce z advertising placement(s). It’s important to note here that disclosing what is and is not funded by an advertiser would not slow down the production of such campaigns, partnerships, native ads — whatever the news outlet wants to call it. Publishers should disclose the terms of their deals with advertisers in quarterly reports and on their website. This is the mandate we should require all publishers to adhere to. It will secure the separation of church and state, editorial and advertising. It will provide people with the level of transparency journalists should always offer for readers. Often, when writers discuss the ethical implications of native advertising, and how the newsroom feels about the practice, they seem to forget that editors know it helps the paper. Editors are aware that if they can work with advertisers without sacrificing their vision and mission, the extra dollars help secure the newsrooms’ survival. Editors and reporters in the newsroom know the revenue generated by T Brand helps secure their job. We should stop painting advertisers as the problem and start realizing that journalists are also responsible and need to stand up to editorial interference. Ava Sirrah is a Ph.D. candidate at Columbia University, where she studies how native ads impact newsroom decision making. She is interested in regulating the industry, spreading media literacy, and exploring new revenue streams for publishers. She worked at The New York Times for two years as a Creative Strategist. To be fair, using “partnership” as disclosure does adhere to FTC standards. Perhaps the issue is more with the standards that are acceptable? Yes, I think we are saying the same thing. The current standard is not acceptable in my view. The FCC standards don’t guarantee transparency. The word ‘partnership’ seems intentionally vague and doesn’t make it clear if and how an advertiser was involved in creating the content people consume. So stupid. A hidden disclaimer is not separating anything. It’s little more than creatively shurking responsibility so you can maintain credibility and corporate cashflow.